KAZUHIRO SAWADA 7th Dan JKA. Interview By Dr Anton Sàlat. THUGS & CHESS. By Peter Consterdine. BJORN GRUNSTEIN 6th Dan JKA. Interview By Dr Frank Dietrich. KARATE NI SENTE NASHI. By Paul Herbert. SHODAN! THE HARDEST WORD TO HEAR. By Nigel Edginton-Vigus. TRUE KARATE. By Brian Gonsalves. SHOTOKAN WITH A STICK IN YOUR HAND. By John Cheetham. 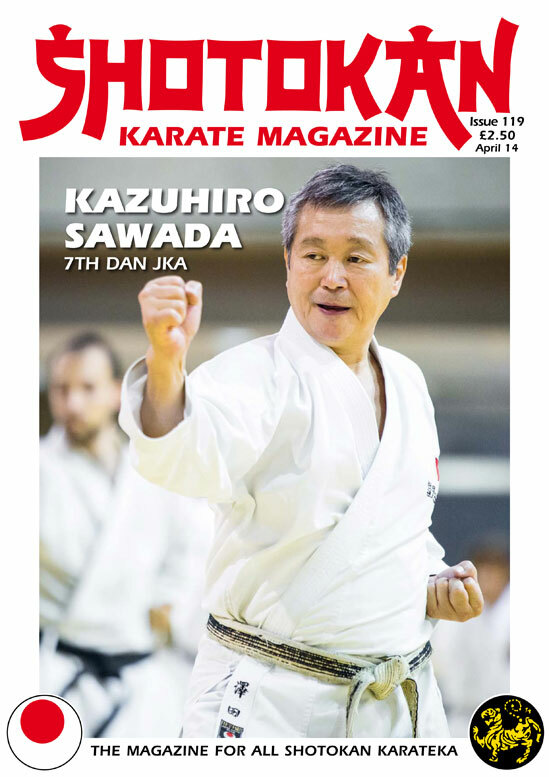 We had a short interview with Sawada sensei, 7th Dan JKA Belgium, in issue 116 and following that interview we received many letters and emails saying how much SKM readers enjoyed it. Generally, people thought that Sawada sensei was a very interesting instructor and wanted to read more about him. Well, we have, as you can see, an in-depth interview with Sawada sensei in this edition, kindly conducted in Kappel, Germany, by Dr Anton Sàlat. We also had an excellent response to Peter Consterdine’s article in the last issue. Of course it’s karate related but Peter is coming from a different angle from most of us, equally focussing on the psychology and tactics of combat which in truth is usually secondary or even non-existant in many traditional karate dojo, where technique and philosophy are more prevalent. Of course most of us are not involved with hands-on security work, where the psychology and tactics are mandatory. For the majority practicing Shotokan, of course the self-defence angle is very important but also we are working towards the ‘art’, always trying to improve, making karate our own and if we can, developing a balanced lifestyle along the way. However, we do need to pay heed to the other aspects on the off-chance that one day we may have to put our karate skills on the line. So understanding the psychology and tactics is vital. I don’t think westerners will ever fully understand the Japanese culture. However, many people believe that westerners have most definitely understood karate and even taken it further in certain areas, bunkai/oyo being prominent examples. Some of the applications that we were originally shown/taught 30/40 years ago by many Japanese instructors were quite basic, to say the least. The last 20 years has seen western instructors find realistic solutions to the Shotokan kata which have been a bit of a puzzle to many karateka, compared to Okinawan kata bunkai. 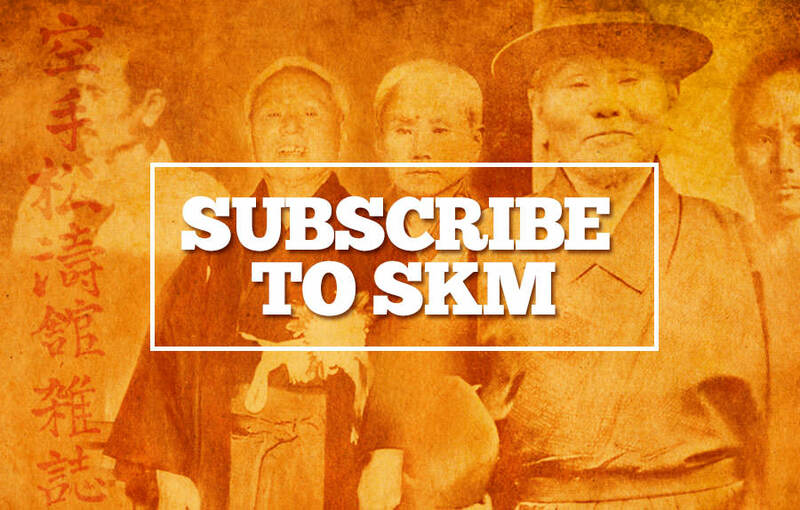 The article and the ‘Letter’ in this issue regarding passing the Shodan examination and becoming a black-belt will have strong memories for many SKM readers. We forget what an important moment this was in our lives, plus the nerves, excitment and sleepless nights during the build up! We had already prepared the interview with sensei Bjorn Grunstein (JKA Sweden) several months in advance when I heard the terribly sad news that he had passed away on 12th November 2013. So, this will be a fitting tribute to this very dedicated, strong character. Rest in peace Bjorn. Good health, good training. Editor. SHOTOKAN WITH A STICK IN YOUR HAND! By John Cheetham. Master Gichin Funakoshi, practicing Bo kata. This got me thinking about something I have thought for a few years now and this article will explain my observations. The Shotokan kata as most of us practice them are in fact a ‘mixture’, a veritable melting pot of empty hand fighting techniques and techniques which imply or suggest that we are using/holding a weapon, either offensively (attacking) or defensively (blocking) and that weapon in my opinion is most definitely a Bo or Jo. So the comment about... ‘Shotokan with a stick in your hand’ carries a lot of truth in my view, although my friend’s intention seemed somewhat different! More ‘tongue in cheek’ you might say! As a typical example you only need look at the second two movements in Shotokan kata Bassai Sho to see that obviously this is a Bo/Jo technique. Of course people have come up with all kinds of (and sometimes even ridiculous) empty hand explanations/applications, bunkai and oyo etc, for these obvious weapons techniques but the truth is plain to see, these are most definitely intended to be movements whilst using the Bo or the Jo. As I said before, the Shotokan kata the way we perform them nowadays are a mix and match of techniques and movements, some empty-handed and some with a weapon, I can’t see any possible argument against this concept. They are not pure forms unlike many Goju-ryu Okinawan kata, which seem to have definite applications without changing or adding anything in the kata. How they (Shotokan kata) eventually arrived at their present form is a bit of a mystery and nobody really seems to have a positive answer, explanation or more importantly, evidence to explain this turn of events. But it’s worth mentioning that there are many old photographs of Shotokan’s founder, Master Gichin Funakoshi using the Bo (see photo above). And I remember seeing several seminars where the late Nishiyama sensei never had the Bo out of his hands, in order to explain many techniques and movements. This weapon is undoubtedly a part of Shotokan’s history and development, without question. (In the photo sequence below you can see the application from the Shotokan kata Kanku Sho and Meikyo using the Jo). After doing the Shotokan kata for 40 odd years, to my mind many of the kata movements as we practice them, make far more sense with a ‘stick in your hand’ than they do as out and out, hand to hand (empty handed) fighting techniques. I saw a DVD recently of some very senior (in both rank and age) Japanese Shotokan sensei doing Bo kata and then the applications of the kata, Bo against Bo. For example Heian Shodan No Bo kata. It was very impressive but very simple. In fact, in my view the weapons sections with both the Bo and Sai on the DVD were far more impressive than the normal Shotokan kata which were also demonstrated. (If you want to know more about these Shotokan DVD’s you should get in touch with sensei Ged Moran from Legend Productions, (see Legend advertisement in this edition for contact details). Interestingly, when you watch a demonstration of Okinawan Bo kata you can see many similar movements to the movements that we use in our normal Shotokan kata (without the weapon of course). There must be something in that don’t you think, a definite connection? This whole thing about Shotokan being a ‘long distance’ style is rubbish to my mind! Nobody has a real fight from ‘long distance’, as we all well know. The only reason it’s long distance is because the original idea would have been to have some kind of weapon in your hands. Using the exact same action as a gedan barai to an oie zuki attack, whilst holding the Jo or Bo. All the Heian kata work perfectly with a ‘stick in your hand’, as do Bassai Dai, Bassai Sho, Jitte, Meikyo, etc... of course they are NOT Bo/Jo kata per se... but what’s wrong with that? They certainly make sense. And they definitely work stick against stick – as applications. So, I totally disagree with my friend’s little comment about ‘Shotokan with a stick in your hand’ as if it has no value or meaning. Judging by the photo, it certainly looks like Funakoshi sensei thought it had some relevance! Get a stick (Bo/Jo) in your hand and do Shotokan kata Heian Shodan and you’ll see what I mean. It works perfectly well. Many Shotokan dojo practice kata applications done in a form of yakusoku kumite, but sometimes they don’t really compute, they are truthfully unrealistic, unlike Goju kata which make perfect sense as close range fighting techniques. However, I should not even have mentioned the phrase ‘close range’ as it’s blatantly obvious that a real fight happens at this ‘close range’ distance. I mean, let’s face it, oie zuki (lunge punch or stepping punch) for most people, is a bit ridiculous as a self-defence punch!! Nobody would do that. Unless of course you have the speed and technique of someone like the JKA’s Tatsuya Naka sensei.... Do you remember his oie zuki in one of the fight scenes in the film Kuro Obi, now that would work! However, the stepping action of oie zuki with a stick in your hands (see photo’s above using the Jo) works perfectly, with exactly the same action as oie zuki. Of course, I’m not saying that we should all start practicing the Shotokan kata whilst holding a Bo or Jo, but you really should give it a try sometime as a supplement to fresh air kata practice. And it also makes you use your body in a smooth way with a slightly different feeling of focus. (In the photo’s opposite, you can see how this sequence from Shotokan kata Heian Yondan can be easily adapted for the Bo or Jo without making any alterations or additions to the movements apart from the fact that you have a weapon in your hands and it makes equally as much sense to me as the empty hand application). I like this idea that the Shotokan kata are a mixture of empty handed techniques and also techniques that obviously require the use of a weapon. It creates a really good balance in my opinion. Of course if you are really interested in Bo kata then my advice would be to study with a specialist teacher, although there are some good Okinawan Bo kata on the internet and even basic instruction given. The fundamentals are quite easy to follow but of course as with everything of a physical or artistic nature, there are more complex methods of manipulating the Bo or Jo, but the basics are quite straightforward, it’s not rocket science. I think us Brits sometimes forget that a few hundred years ago the wooden ‘staff’, which is exactly the same as a Bo, was part of our fighting culture and was used by the peasants of that medieval era as a weapon. A bit like the Okinawan situation. Take a look at any Robin Hood film and you will see a good staff fight on a bridge between Robin Hood and Little John, it’s quite skilful. Unfortunately the staff has completely disappeared from the old British fighting culture now, even though we still have jousting contests from the same era, (guys dressed as medieval knights fighting on horseback with a jousting lance) but I’ve never seen staff fighting at one of these jousting events. A great pity in my view. So, in the final analysis maybe the idea of ‘Shotokan with a stick in your hand’ is not as crazy as it sounds! I don’t think so. Thanks to SKM secretary, Clare Worth for demonstrating the photographs using the Jo. We were going to try and re-create the staff fight scene on a bridge but we couldn’t get hold of the Robin Hood costumes in time (smile). Good training.